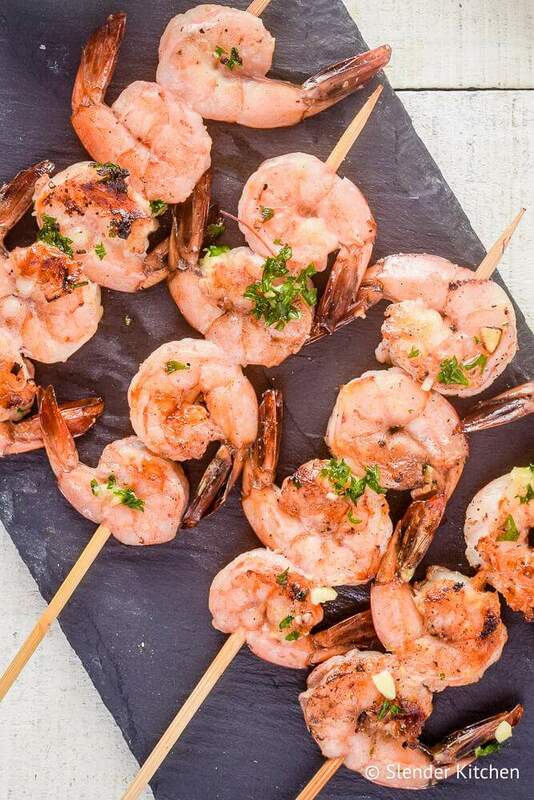 Garlic Lemon Shrimp Skewers have all the flavor of shrimp scampi in a simple skewer that’s ready in less than 15 minutes. This Easy Shrimp Kababs cooked in butter, garlic, and lemon are a quick meal that everyone loves. Plus they are so versatile. Serve them with some Grilled Broccoli, Mexican Chopped Salad, or your favorite side dishes. Kabobs are my favorite go-to when I’m craving a summery dish. Whether or not it’s summer, that doesn’t really matter. Of course, these are great on the grill (and we’ve been known to fire up the grill when it’s snowing), but they are also just as good in the oven or cooked over a grill pan. Plus, the presentation is adorable and, you can almost get away without dirtying any utensils as well. I mean, who doesn’t love eating off a stick? 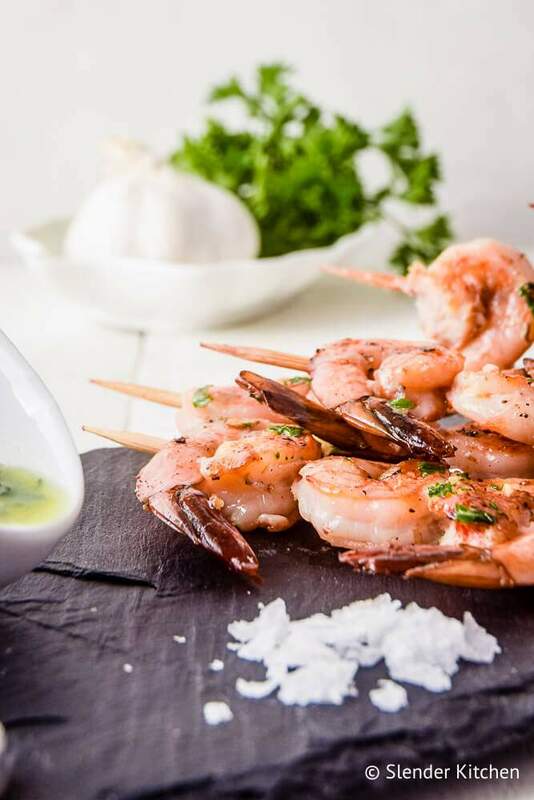 Point is, Garlic Lemon Shrimp Skewers are a quick-and-easy meal that is packed with lemon and garlic flavor that you’ll find yourself making again and again and again. I do have one little confession to make, however, and it pains me to say it: Currently, I am the only one at home who eats shrimp! My husband doesn’t eat any seafood and we haven’t introduced shellfish yet to our little one. However, that doesn’t really stop me from cooking them anyway. I mean, when a recipe is as easy and delicious as this one, I have no problem cooking for one. Plus I usually make enough for at least two servings since the leftovers are so good. The key to this recipe really comes in the simple, stove-top lemon garlic sauce that the shrimp are coated with. The garlic is first cooked in butter and then finished with lemon juice and parsley. Then, once the shrimp come off the grill, they are brushed with all of that garlicky, buttery goodness. How long do you cook shrimp kabobs? Shrimp is a really quick cooking protein and can get really rubbery if overcooked. Therefore, you always want to pay really close attention to them when they are cooking to make sure they don’t overcook. Shrimp is ready when it is pink and opaque. For grilling shrimp skewers, they will take about 2-3 minutes per side depending on the size of the shrimp. In the oven, they take about 4-6 minutes per side. Smaller shrimp may cook even more quickly. Can I add veggies to my shrimp kabobs? Personally, I don’t recommend cooking shrimp on a skewer with veggies unless they are precooked. The reason is that most veggies need more time to cook then shrimp and your shrimp will overcook while you wait for the veggies to finish. Normally I recommend cooking some veggie kabobs on the side. If you really want to combine, par-cook the vegetables first so that you are only using the grill to add some nice char to the vegetables. These kebobs are amazing but you know what makes them even more amazing? Side dishes! I really like shrimp with rice. White or brown (or even cauliflower) — a little goes a long way. If you’re firing up the grill, why not kebob some veggies too? Cherry tomatoes, mushrooms, bell peppers, and onions all grill up well (and stay put on the stick). Other grilled veggies are great, too, like broccoli, Brussels sprouts, asparagus, or this yummy Grilled Cauliflower. Quinoa or another whole grain goes great with shrimp, too! Add a nice side or Caesar salad with another grain for a well-rounded meal. This Healthy Kale Caesar is amazing with shrimp kabobs on top. Try a Greek pasta salad or this fun Grilled Caprese Salad for another “salad” side option that isn’t so lettuce-heavy. Roasted chickpeas are such a great snack and side, you’ll love to eat them by the fistful with this dish. A nice slaw would work here too. You can easily find pre-made slaw mixes that come in the old-fashioned cabbage form, but also broccoli- and carrot-heavy as well. Salads round out this shrimp dish. You can go right on ahead and add this shrimp right to the top of a bed of lettuce or other salad greens. Toss in some red onion, capers, feta, and kalamata olives for a healthy, delicious Mediterranean dinner. This shrimp is phenomenal in a wrap! Use corn, wheat, low-carb, your choice — fill it with your favorite Mediterranean ingredients and go to town. Hummus or guac go great with this shrimp too. You might not think so but it just works! Serve this shrimp over a bed of rice before drizzling with the sauce so the rice can absorb the garlicky, lemony flavors as well. Take the shrimp off the skewers, and cut them in half and add them to a pasta salad, quinoa salad, or just any old grain salad. Pasta! Add shrimp to a high-fiber or whole wheat pasta of your choice. Top with feta and a few more parsley flakes and viola! Your mouth will never be the same. Pizza! Buy a pre-made crust or make your own. Then, add pesto instead of red sauce and layer with the shrimp, some arugula, and grated Parmesan. Broil in the oven for a few minutes, just until the cheese starts to melt and everything is heated through. So yum. This shrimp is great in a taco too. I think you know what to do here! If not, here is some taco inspiration. 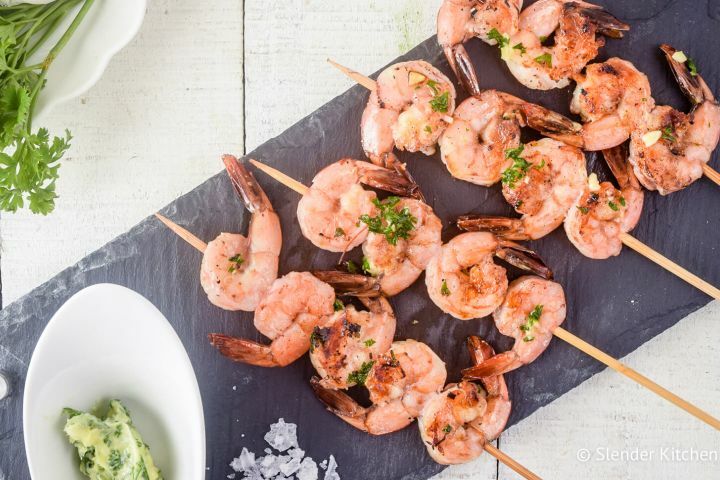 How can I use leftover Garlic Lemon Shrimp Kabobs? Shrimp is still good leftover for a short amount of time, about three to four days in the fridge, technically, but I think it’s more like one to two days for best flavor. So, if you plan on having leftovers, may I suggest you plan on having them the next day or by the second day at least. You can try any of the ideas in the previous two sections for using up leftovers. You can also add this shrimp to a store-bought seafood bisque, or make a healthy po’ boy sandwich with some nice, crusty bread. I have also chopped up leftover shrimp finely and used it in a shrimp dip for an appetizer. Or, use that same diced shrimp for a shrimp cake (think crab cakes but with, well…shrimp). Make a shrimp salad with some light mayo, more lemon juice and parsley and then add in other ingredients that you like, like finely diced celery, capers, dill pickles, whatever floats your boat. This shrimp is so versatile — let me know what flavor combinations you come up with!